Average condominium prices in the Phra Khanong district of Bangkok have risen by more than 50 percent in just one year, according to new research from Knight Frank Thailand. 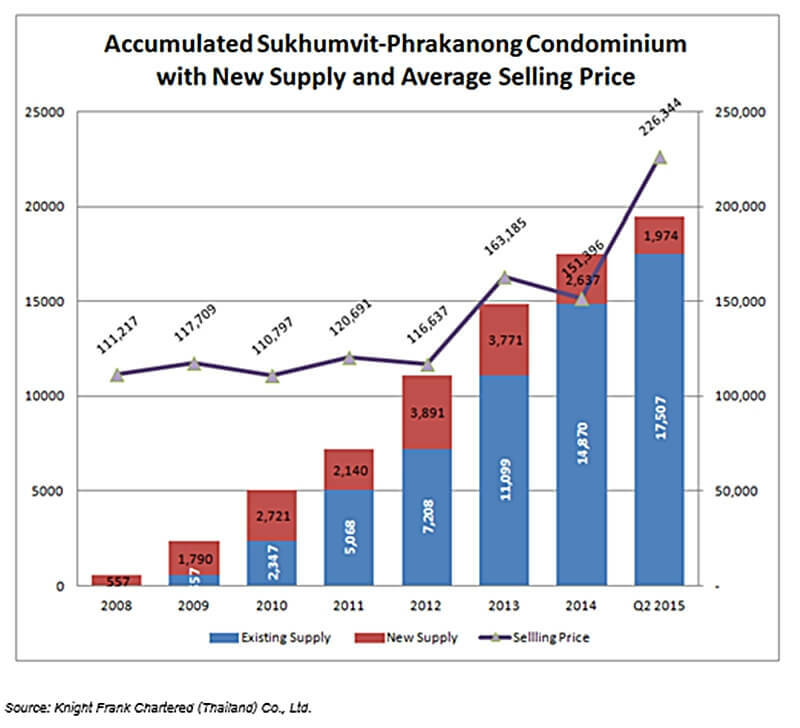 According to Phanom Kanjanathiemthao, Managing Director of Knight Frank Thailand, prices in Phra Khanong as well as in the Petchburi and Ratchada areas were still rising during the first half of 2015, even as supply in these areas was increasing. He noted that average prices for condominiums in Phra Khanong have risen to THB 226,000 per sqm – more than 50 percent up on last year. Phanom reported that in the Petchaburi and Ratchada area, between 2008 and 2015 there were 46,363 condominium units launched for sale. During the first half of 2015 there were 4,593 units launched with an average selling price of THB 110,454 per sqm reflecting an increase from last year of 28 percent. Sales rates for condominiums launched up to the end of June 2015 was 29.37 percent. Compared with the past three years this rate is considered to be stable, according to Knight Frank, despite the general market downturn. Sales prices for Grade ‘A’ condominiums in the Petchaburi and Ratchada area was in the THB 116,667 to THB 159,173 per sqm range, with an average price of THB 137,365 per sqm. As for Grade ‘B’ condominiums the price was between THB 66,429 per sqm and THB 112,857 per sqm, with an average price of THB 92,135 per sqm. Phanom added there were 1,974 condominium units launched in Bangkok from Sukhumvit Soi 1 to Phra Khanong during the first half of the year. This rate was the same as that of the past three years, however prices have increased by up to 50 percent compared to past selling prices. Average prices have increased each year, according to the real estate firm, citing the rise in high-end and Grade ‘A’ premium projects with prices in excess of THB 250,000 per sqm as one reason for the increase.